The higher education strike affecting an estimated 1 million students this week may have been provoked by hardline positions taken by some of the UK’s wealthiest universities, according to academics fighting against pensions cuts. Oxford and Cambridge universities and several of their colleges have backed policies resulting in the harsh cuts to pensions prompting professors at those institutions to mount efforts to overturn their support. The strike, called by members of the University and College Union (UCU), originated over an attempt by Universities UK (UUK), which represents university employers, to change the terms of staff pensions and end defined-benefits on retirement because of a shortfall in funding. University employers have so far refused to compromise over the swingeing changes they claim are needed to save the pension scheme, which would see a typical academic losing about £10,000 a year from their retirement income. But the employers’ backing may have been distorted by giving a number of small, wealthy Oxford and Cambridge colleges the same weight in a crucial survey used to set policy as large universities were given. Most of the colleges said they wanted lower risk of pensions losses. Michael Otsuka, a philosophy professor at the London School of Economics who first queried the voting patterns, said he estimated that about 16 Oxbridge colleges were counted in the survey, on top of individual votes by Oxford and Cambridge universities themselves. “Oxbridge votes did not distort the UUK pension risk survey – we consulted more than 350 USS employers, all the USS employers, as we are obliged to do, and took account of all the responses we received,” the UUK spokesperson said. The UUK survey question backing the radical changes – “My institution wants less risk to be taken, acknowledging the implications this might have for benefits and/or costs” – was supported by 42% of the 116 responses received, according to Otsuka. 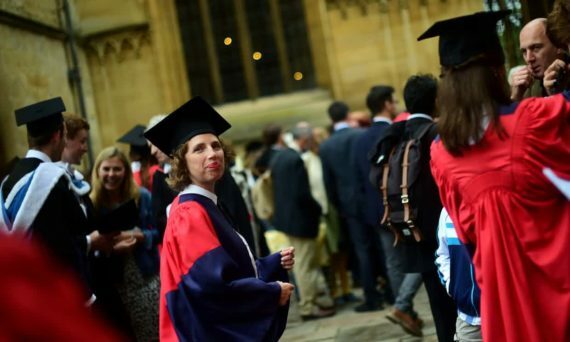 In Oxford, some senior academics have set in train urgent steps to change their institution’s stance backing the pension overhaul, by proposing a debate at the university’s powerful congregation, a policy-setting body made up of all tenured staff. “Colleagues here were completely appalled to learn of Oxford’s role in dismantling the pensions system for academics across the country – we should have been consulted,” said Prof Karma Nabulsi, a fellow of St Edmund Hall. “We have submitted two resolutions instructing the university to immediately reverse the position Oxford took on pensions risk, and signatures are still flooding in. The motion proposed instructs Oxford’s leadership to change its vote in favour of accepting a proposal made by the scheme’s trustees, and to accept a higher level of risk of pension failures in the future. Meanwhile the strike appears set to start on campuses across the UK on Thursday, the first day of up to 14 strike days that have been proposed. UCU has warned that if the dispute is not resolved soon then industrial action would continue – and may disrupt this summer’s undergraduate exams. “We are happy to meet for meaningful negotiations directly with UUK or through mediation right away,” said Sally Hunt, UCU’s general secretary. At our site, you can order a different educational paper.